Welcome to Part 2 of my Easter Collection! 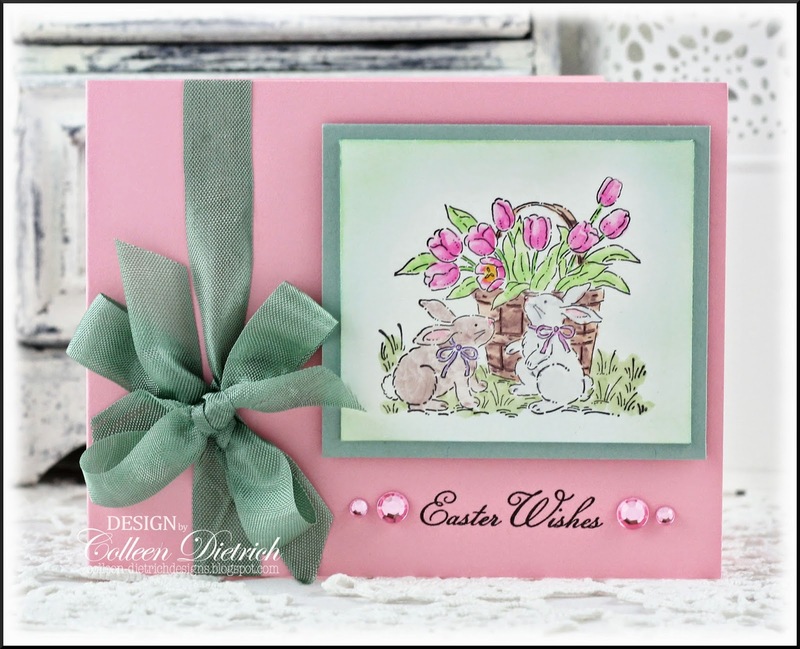 This week, I'm sharing all the Easter cards I've made over the last month. Many of them went to Arts Plus Gallery for sale, and I kept a few to send out to loved ones. 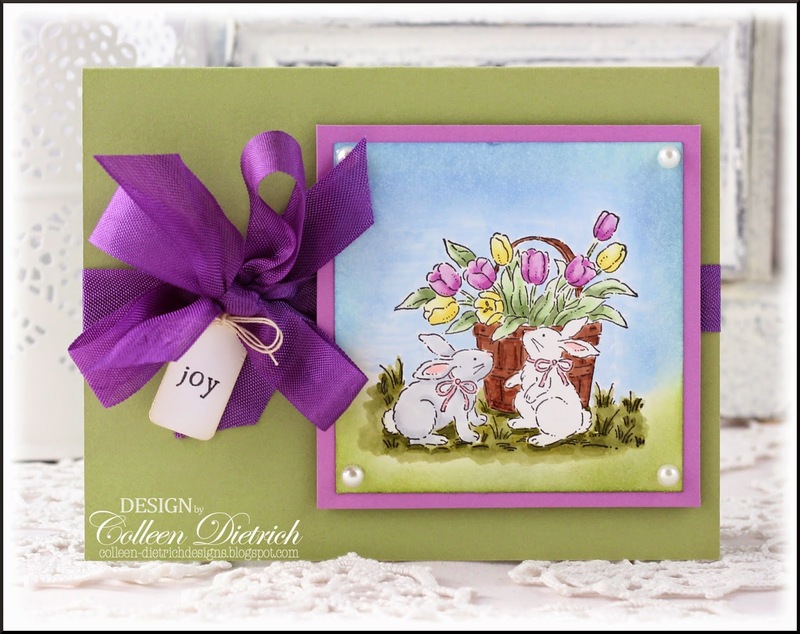 This sweet bunnies-and-tulips stamp is an older Stampin' Up! image, but I have no idea what set it came from. Does anyone know the name? I'd stamped and colored this a few years ago, and it felt nice to finally put it on a card. For my birthday, I received some more rolls of Hug Snug seam binding. This one is Pansy Purple, and oh is it a luscious color! The sentiment and tag are also birthday gifts; both are by Papertrey Ink. Stamps: sentiment - Something To Celebrate; image - SU Paper: Pretty In Pink, Sage Shadow, Whisper White - SU Ink: Memento Tuxedo Black - Tsukineko; Sage Shadow - SU Fibers: Metal Green - Hug Snug Accessories & Tools: Copic markers; pink gems - Queen & Co. The next one really makes me happy. It's bright and fun! 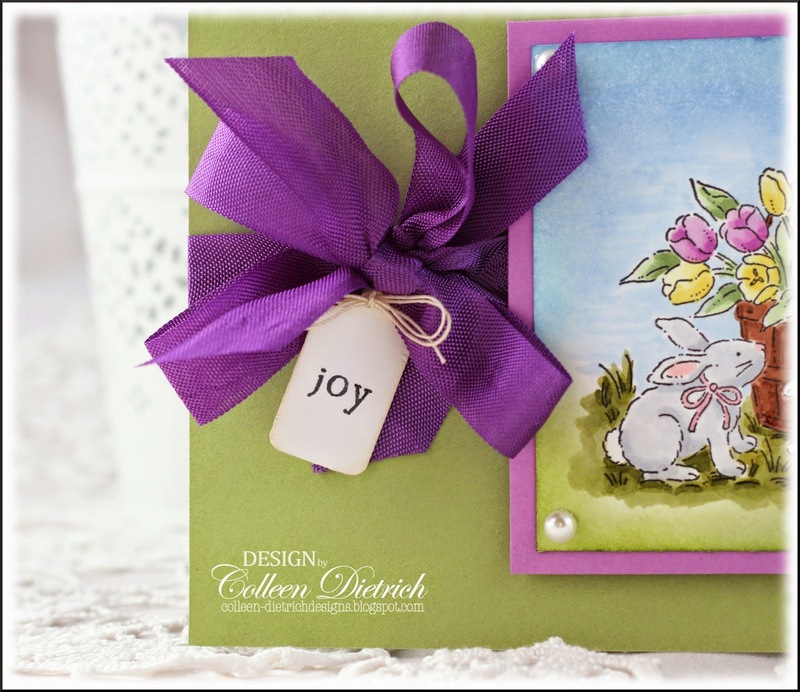 The sentiment and bunny are from Stampin' Up!, and all those flowers are from Wplus9's Fresh Cut Florals, another birthday gift. These are all just darling! I especially love the ribbons and bows are the first ones. Tese are all so cute! So gorgeous! I am LOVING those bunnies!!!!! 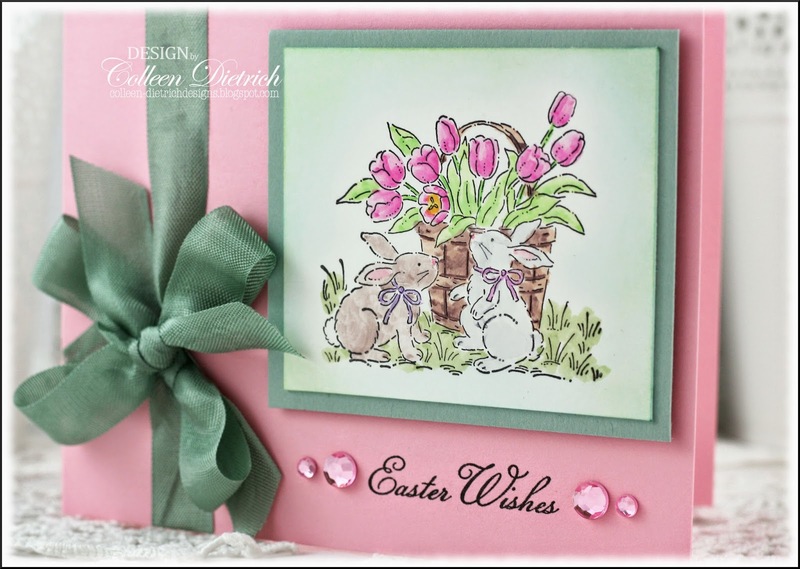 Lovely set of Easter cards. Think the first one is my fave. Nice job tying the seam binding bows! Hippity Hoppity Easter's on it's way!!! These are perfectly sweet and oozing with spring Colleen, love them! 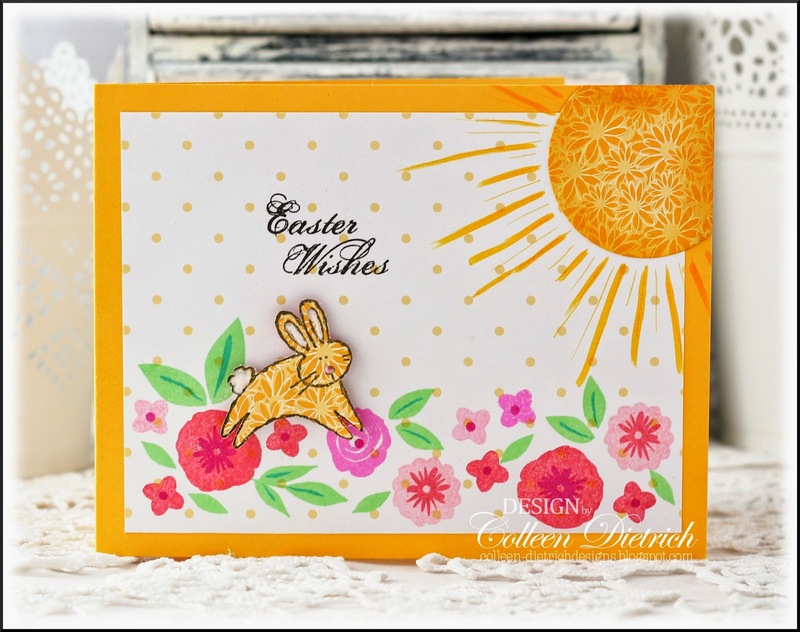 I'm SO loving the Easter cards, Colleen! Darling bunnies with basket. I never have colored images waiting around. Stamped, yes, but never have any spare colored images. I'm glad you finally used it and then made an extra, too. So cute! Also, the yellow bunny and sun has the most fabulous paper. It's really perfect for the sun, especially. Love the flower border. Very bright and happy! 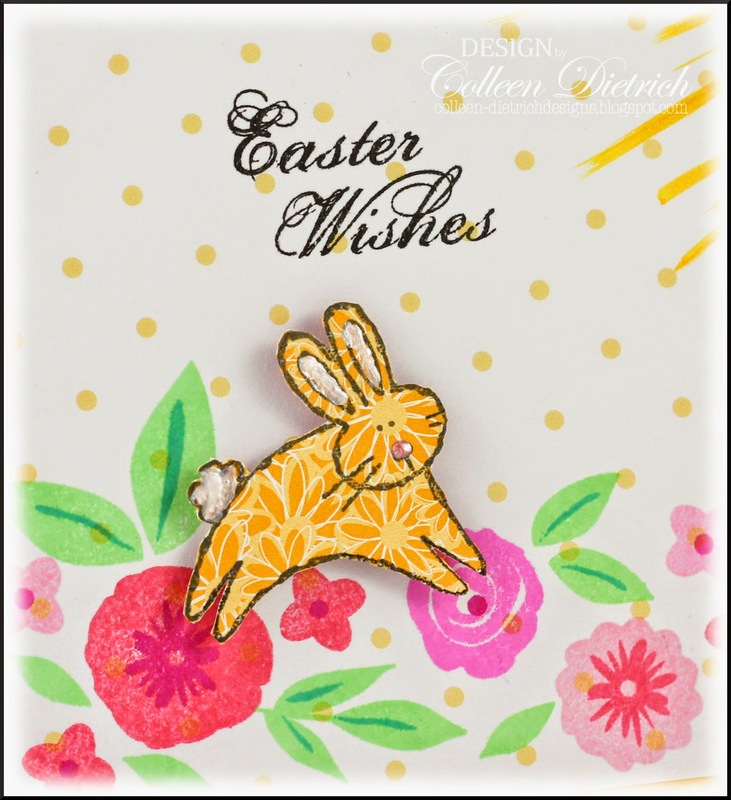 Ok - now I a really think you deserve the Queen of Easter Cards title - and I see there are ever more gorgeous card. Wow Colleen. I am so impressed! Hugz!